Couples tend to share similar body fat levels when they meet – and are likely to stay that way over the years. 10 simple and super effective ways to live healthy ever after. Your partner’s weight – not his sparkling eyes or sense of humor – may have been what drew you to him, finds research in the American Journal of Clinical Nutrition. Couples tend to share similar body fat levels when they meet – and are likely to stay that way over the years. Similarly other research shows that if one partner improves his/her habits, the other may follow suit. Here are 13 lifestyle tips to be healthy together. Be it the extra inches around the waist or a belly, it’s important to not shame your partner over his body. Start by talking about fitness and adding that both of you need to dedicate some time to exercise everyday for a long and healthy life together. Set small goals like scheduling a run three times a week or losing 2 kilos, and reward each other for the hard work with a thoughtful gift. A reward system works well to stay on track. 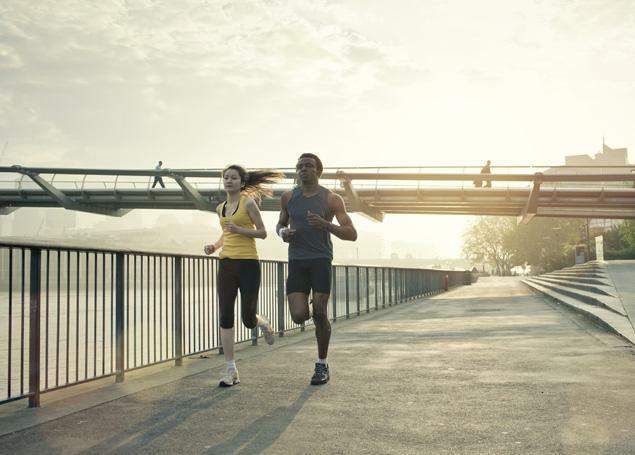 Also track your progress on your smart phone or tablet with apps like Nike+ Running, My fitness Pal or Calorie Counter. You could even start a couple weight-loss blog and share with your social network. You will stay committed if you make your goals public – and encouragement from your friends and family will be an incentive! Some conditions like diabetes and hypertension don’t show up with tell-tale symptoms. So even if the two of you feel fine, preventive health check-ups can detect health conditions before they spiral out of control. Schedule a test in the beginning of the year each year. An expanding waist line and extra kilos can put both of you at the risk for a whole lot of health conditions including diabetes and heart disease. Bring out that measuring tape and weighing scale and strip down to face the naked truth. Measuring up couldn’t have been more fun. His waistline should be ideally below 35 and yours below 33 inches. Do a quick bMI calculation (weight in kg/square of height in meter) – a bMI between 18 and 23 is healthy for both of you. If the numbers are on the higher side, speak with your GP to find a plan to get you in the normal range. Experts say that out of all exercise regimes, yoga is one of the best kinds of exercise to practice with your spouse. Start with a trial session and chances are, you’ll get hooked. Yoga is not just about stretches and asanas; it also promotes a sense of well-being. While it helps you connect with yourself, sharing a mindful experience together will only help further connect with your partner. Asanas like veerasana or the heart meditation are some essentials of partner yoga. A post dinner 20 minute walk is a super way to catch up with him. It goes without saying that this easy-paced walk helps improve digestion while torching some calories. Of course, all the hand holding can release the love hormone oxytocin that evokes feelings of contentment, calmness and a sense of security focused around the partner. When you get back from work, avoid raiding the fridge and pantry for savories and sweets. Your husband is a snacker? It doesn’t mean you have to be too. Stop and consider whether you’re actually hungry or just “eating to keep him company” before digging in, and encourage him to do the same. If he just cannot do without some, keep some healthy munchies (roasted chick peas, dried fruits, unsalted nuts and seeds and granola bars) for him, but avoid indulging in them yourself. Keep in mind that men generally require more calories than women. Many studies show that breakfast eaters are less likely to be overweight than those who skip their morning meal. Eating breakfast is like giving your metabolism a kick-start, causing it to work faster and burn more calories. So make sure both you and your husband eat a healthy breakfast. Choose low glycemic index foods to keep blood sugar low and energy levels high. There are several healthy options to choose from – apples, steamed sprouts washed down with green tea, papaya, vegetable poha (flattened rice) and orange juice, or anything else that both of you relish. Set aside those 15 valuable minutes to eat together before you head out of the door. A satisfying breakfast will keep mid-morning cravings at bay and you will not reach out for unhealthy chips and biscuits during morning meetings at work. Involve him in picking healthy foods. 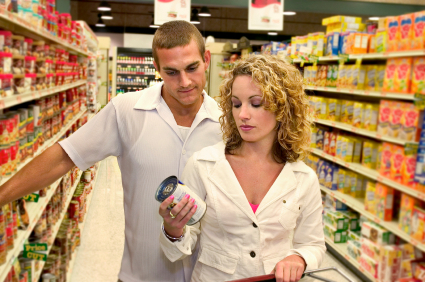 This way the two of you can mutually decide the healthy food items that go into the cart, and you won’t hear complaints later. Zara and Mango may not exactly be his thing, but the fitness stores can be. Check out the latest fitness gear – you may just be motivated to try a new form of workout together. Oh, and the hours of mall walking can burn calories to boot. Whether it’s signing up for a dance class or enjoying a game of tennis or going cycling outdoors, choose an activity both of you love. If you have a gaming console at home work out on Wii Fit or the Kinnect. Finding the couple zone can help partners connect better while having a whole lot of fun. You need at least 7 hours of sleep every night to reboot, so work backwards from your morning alarm time. Sleeping and waking up at the same hour every day keeps your biological clock steady and ensures sound sleep. To make things easier make your bedroom a no-screen zone. Also avoid the urge to check your smart phone once you hit the bed. It distracts you. Plus, the light from the screen interferes with sleep by delaying the release of the sleep hormone melatonin. If your partner’s snoring is severe and keeping you awake, it’s time to visit the doc to check for blocked nose or sleep apnea. Snoring doesn’t just spell bad news for the snorer; a Mayo clinic research shows that second-hand snoring can cause anything from noise-induced hearing loss, higher-than-average rates of aches and pains, poorer mental health and an abysmal night’s sleep (some spouses’ sleep is disturbed 21 times an hour).